IT would have been the most unsatisfactory way for a boxing career to end, but Daniel McShane intends to set the record straight. 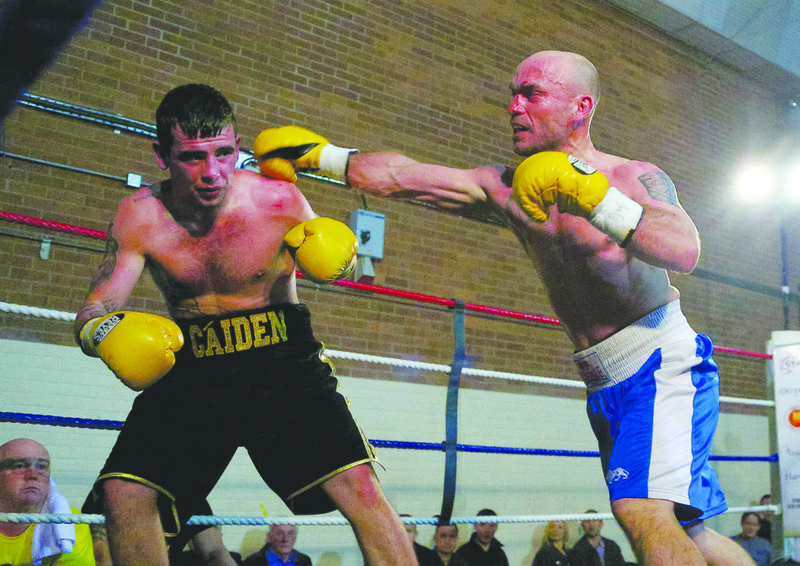 It was March 28, 2015 at the Andersonstown Leisure Centre when the Mount Eagles man took on Zoltan Horvath in his 10th professional bout intending to maintain his perfect record, but in the second round disaster struck. The Hungarian, who had been attempting to spoil McShane’s work from the opening bell, twisted the shoulder of the West Belfast man in a clinch that resulted in a dislocation, forcing the fight to be stopped in his favour with McShane unable to continue. It was a classic case of adding insult to injury. It of course forced a long spell out of the sport for the now 23 year-old who grew somewhat disillusioned with boxing, but a chance meeting with former Commonwealth heavyweight champion, Martin Rogan set him back on the boxing path that will see him return to the ring on April 22 at the Devenish Complex. “Ah, I have just been spending time with my family since I injured the shoulder,” said McShane who juggles his boxing training with his full-time job as a barber at The Cambridge in Stranmillis. “That was my first defeat, but in my eyes it wasn’t a defeat. A defeat is when you get beat fair and square. In that fight I got injured and couldn’t go on. He was a dangerous opponent. Alright, he was a journeyman but every boxer has two arms and two legs. It wasn’t just the loss that hurt, but the feeling he had been instantly forgotten that saw him lose the desire to get back into the ring. “The thing that really gave me a sickener was that after the fight, nobody contacted me,” he continued. A year had passed since the injury and McShane admits he was enjoying his life outside the ring, spending time with his family including his son Cáiden. The luxury of not having to diet saw his weight rise to well beyond the super-featherweight limit where he campaigned, but one day a customer came through the door for a haircut and things suddenly changed. “Big Martin Rogan came into the shop to get his hair cut and was saying that I was out of shape and should get back into it, not to waste my talent,” revealed McShane who intends to return to super-featherweight after his first fight back at lightweight. “I went and trained with him, not to box really but just get fit again and we gelled so well. I got hurt again but then saw the shows in Belfast with Kieran Farrell, with my old manager Mark Dunlop and thought I could give it another go. Martin says he is willing to stand by me and show me everything he’s learned. Rogan is managing and helping with his training at Academy One Fitness and with his boxing where he trains out of St Paul’s, his old amateur club alongside Ralph McKay. It is a hectic schedule for McShane, whose day involves training at 6am before spending a day at work and then going back to the gym for boxing training. It means a lot of time away from his family and with a daughter set to arrive in July, McShane intends to make his sacrifices count although admits reaching the top requires more than talent alone. “Boxers don’t have a very long career, but if people get behind me and help to sell tickets, that can help me go to bigger and better things,” he explained. “I’m not looking at these silly titles I won before, I want major titles. I want British, European and world titles. Let’s be realistic, every boxer wants a world title, but it’s very hard to get there. I intend to give it a good go. You do need a bit of luck and need the fans behind you because without them you will get nowhere. “All promoters want is money, so if you aren’t bringing a good crowd, they aren’t going to put you on their show. The return of the big shows to Belfast could be McShane’s gateway with proposed homecoming fights for Carl Frampton and Ryan Burnett plus the continued return of the BoxNation cameras, but he knows he must put himself in a position to get to that point first. He would dearly love to rematch Horvath to avenge that loss, but with the veteran Hungarian not having boxed in a year, that may not be possible so he is happy to take his frustrations out on whoever is put in front of him to get his career back on track. “I’ve asked to get him back, but I’m not sure if he’s busy,” he said. “I’m a fighter, so I’ll fight anybody. I would like to fight him in this one or in the near future to set the record straight, but this haunts me every night. Every training session I can see his face. He might think he beat me, but he didn’t. It was through injury. That willingness to take on all-comers extends to anyone who stands in his way, but he is not content to merely pad his record against journeymen and instead wants to push on in this second phase of his boxing career. “I don’t know what route I’m going down, but I won’t be fighting journeymen now,” he insists. “I’ve done my apprenticeship, so now it’s time to move on to big things. One day I want my son and daughter to turn around and say ‘my daddy was a champion’. “If we have to travel, we will. I fought Zoltan Kovacs and he is a (WBO) European champion, so I could even go after him again and get that belt. Or we are looking at Youth titles and getting ranked that way to get my name out there. “I look at Martin and his son with him winning a Commonwealth title, he looks up to him like a God and that’s what I want. With Rogan helping guide his career now and also back in training himself, McShane says he is in a much better place with a strength and conditioning routine introduced and an increased appetite to do the hard yards. Previously, he admits he would take weeks off after fights, but this time that will not be the case as he intends to sit around his fighting weight should a last minute opportunity arise he would be prepared to jump at. “He (Rogan) knows what I’m going through because he’s doing nearly the same training as myself, so it’s great to have someone like that,” he explains. McShane is therefore intending to come back bigger and better than ever next month, but whether his old ‘Insane’ ring moniker remains is yet to be decided. “There are some people telling me to get rid of it and some telling me to keep it,” he offered. McShane is certainly intending the outcome will be different this time as the West Belfast boxing barber looks to prove he is a cut above the rest.